Is Mesotherapy a Magic Potion to Dissolve Cellulite? In your quest to get rid of cellulite you will certainly come across Mesotherapy as you review various treatment options and products. Claiming to have the ability to dissolve fat, and having a convincing endorsement by a person who claims to have written the book on cellulite, may get you excited enough to give it a try. STOP. Think Again. Read this first. Mesotherapy is different from the most modern and non-invasive cellulite treatments since it relies on injections. It’s a combination of medicines, many homeopathic, stuck into various areas affected by cellulite. 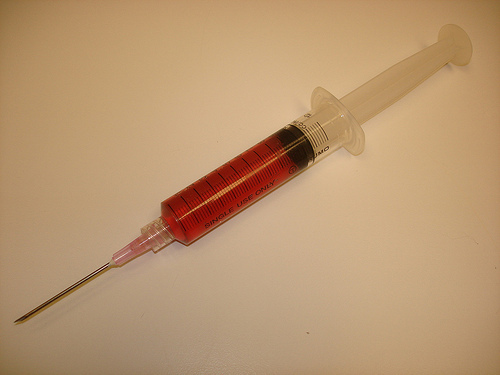 Mesotherapy treatments are not FDA approved for safety or for effectiveness. So should you consider a Mesotherapy potion to solve the cellulite riddle? With so many claims by so many treatments that address a beauty problem which affects so many women, and some men, it may be a good idea to eliminate the ones that have the potential for the most risk and least reward when experimenting with your body. This same doctor explains the four stages of cellulite ranging from Stage 0 to Stage 3; 0 being not visible to 3 being visible when standing up or lying down. He reports on being most successful with those in Stage 3, the worst stage, and as you can imagine the most desperate for a solution. This doctor describes the emotional toll that cellulite can have on a women which includes lower self-esteem, fear of ridicule and embarrassment, effects on romantic relationships and libido, avoiding certain activities, having less fun, and stress from trying to cover up cellulite. A Consumer Report claims that the most fraud is found for products related to cellulite and baldness since they prey on the emotions of the victims. Mesotherapy claims it can eliminate cellulite on legs, thighs and buttocks in just 10-25 sessions. Since the product and treatment is not FDA approved, ads and companies cannot be penalized by this government regulating organization for making such a claim. Although, it’s seems odd that if the product were safe and effective, that FDA approval would be aggressively sought. Makes you wonder, right? The Mesotherapy potion mix varies from patient to patient. This makes it hard to replicate or to even study in terms of treatment protocol or level of effectiveness and safety when treating cellulite. 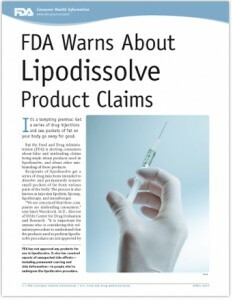 Finally, a warning was issued by the FDA in July of 2010 cautioning the public about claims made by any injectable drug to eliminate fat, naming Mesotherapy as one of those treatments. In went on to say that it had received several reports of serious side effects including permanent scarring, skin deformation, and deep painful knots under the skin at the injection site. Yes, cellulite is a troublesome problem. And yes, there is a real solution for improving your skin and addressing the true cause of cellulite. However, Mesotherapy may not be the easy answer you are seeking. It’s a potion, a modern day snake oil. And remember what happened when those fairytale princesses of childhood drank a potion? NOT GOOD. But you have to understand what cellulite actually is, and how your body works. Then you can use the right approach to get rid of cellulite. You don’t have to live with bumpy, uneven skin, and you don’t have to spend a fortune on shallow promises, gimmicks and dangerous scams that don’t work and may actually hurt you. I need you to help me keep proving to the world – especially the women who are seeking the cellulite answer that the right types of exercises can stimulate the trouble zone muscles, get lifted and firm – Hence reversing the cause of the cellulite bumps and dimples…. Already on the SYMULAST Program? If you’re already on the program then there is no need to watch the video again, BUT – you should share this page with any of your friends who might be considering Mesotherapy or Lipodissolve.